Form Description: Keeping your financial matters straight is of vital importance to any and all businesses. One of the best ways to do that is by periodically conducting an internal audit to see where things stand. 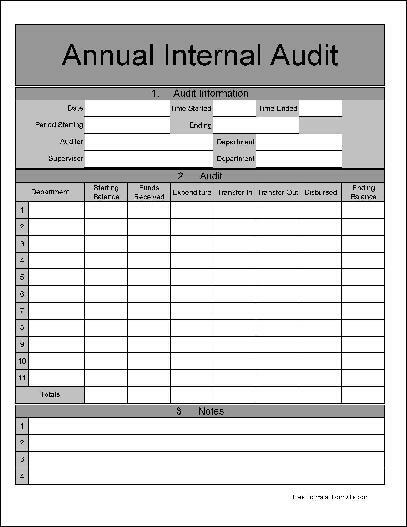 Simply use this Annual Internal Audit Form to see where you stand once a year (preferably randomly) and you will be able to easily tell whether you have a problem or not. This particular edition of the Annual Internal Audit Form has been created with some extra wide rows. These extra wide rows allow you an easier time of entering the information you want by hand. Definitely a huge help when you are trying to figure out the exact amounts that needs to go onto the form. Furthermore, this edition of the form has also been created with numbered rows and sections. These numbers will allow you, your employee, and your accounting department an easier time of later referencing what was put onto it. This can be a definite help if, or when, any problems or disputes arise at a later time. Just because you have to deal with some boring paperwork as part of your job, doesn�t mean that the paperwork itself has to look boring. Spice things up a bit with the use of this fancy edition of the Annual Internal Audit Form. You get to pass along all the same important information, but this time it doesn�t necessarily need to be all that boring. Why not take the time to show your fun side? You can download a PDF version of the "Fancy Wide Numbered Rows Annual Internal Audit Form" form absolutely free. You can also, for a small payment, download a fully editable version of the form that you can customize as you desire. (Don't know which format to choose? Here's how to make your choice.) What would you like to do? Formville's free "Fancy Wide Numbered Rows Annual Internal Audit Form" form is associated with the following keywords: project, tracking, finances, audit, internal, tracking, log, fancy, numbered rows, wide rows.